Associate Director Lori DiPrete Brown and Education Associate Sweta Shrestha from the University of Wisconsin-Madison Global Health Institute (GHI) will help introduce a new women and wellness initiative during the Women’s Philanthropy Council’s 25th anniversary celebration Sept. 18 and 19. 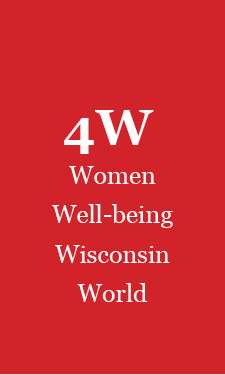 4W, For Women and Wellness in Wisconsin and the World, a campus-wide initiative to make life better for women and the world better for all, draws on the strengths of the School of Human Ecology, GHI, the Department of Women’s Studies, student organizations and partners from government and civil society. The range of 4W activities will emphasize basic needs and human rights, thriving throughout the life cycle, leadership and empowerment, and the development of strong communities based on principles of eco-justice. Di Prete Brown joins Soyeon Shim, dean of the School of Human Ecology, to headline a general session on 4W during a Sept. 19 all-day symposium featuring keynote remarks from UW-Madison Provost Sarah Mangelsdorf and Tashia Morgridge, an educator, author and emeritus member of the Women’s Philanthropy Council. Christine Whelan, director of the Relationships, Finance and Life Fulfillment Initiative in the School of Human Ecology, will discuss trends in women’s philanthropy and family philanthropy. The Women’s Philanthropy Council, supported by the University of Wisconsin Foundation, was founded in 1988 as the first major gifts and leadership initiative for women at a co-educational institution. Read more about the 25th anniversary celebration.